The FluidAir™ Air-Fluidized Therapy Bed provides superior pressure reduction for patients that are experience pressure ulcers and enable to heal their wounds. The bed is designed to operate in home and institutional settings that have adequate floor structure and support. The FluidAir™ bed provides Air-Fluidized Therapy by supporting tl1e patient on a surface of fluidized microsphere (beads). A large volume of air is forced upward through the bead mass causing the beads to behave similar to a fluid, helping to reduce interface pressures. The fluidization level oftl1e beads and temperature of the air flowing upward through the bead mass can be adjusted to meet individual patient needs. Fluidization and temperature can be controlled at the main control panel or the patient remote control. What type of patients benefit from an Air Fluidized Therapy (AFT) bed? Typically patients with large refractory pressure wounds, posterior skin flaps or burn patients benefit from this therapy. In particular, patients who are unable to routinely turn themselves (paraplegics) will find this therapy beneficial in reducing and healing their pressure wounds. The HydroAire AFT bed is capable of taking on patients weighing up to 300 lbs. and typically patients as tall as 6’ 5” in height. How does the bed work? The tub of the bed is filled with glass ceramic beads called micro-spheres and the beads actually compose the majority of the weight of the HydroAire AFT bed weighing approximately 900 lbs (bed weight without the beads is 221 lbs). The beads lie on top of a diffuser board. Blowers within the beds pedestals force air across the board and cause the beads to react like a liquid. This act is called fluidization. What are other advantages of AFT beds? Because AFT beds have such an effective way of reducing interface pressure, one of the side benefits of the bed is helping patients significantly reduce pain associated with pressure ulcers. Commonly used in the post surgical treatments (skin flaps and skin grafts) . Thousands of Micro-sphere (beads) are forced into motion through a high powered blower creating a fluid like surface for pressure re-distribution therapy. High air flow/air loss to prevent skin maceration. Slant wedge head section, inflates to allow for head elevation for improved respiration. Waterproof, vapor permeable top cover. Close supervision is necessary when this product is used by or near children or invalids. Fluid Spills - Avoid spilling fluids on bed controls. If spills do occur, clean fluids while bed is unplugged while wearing rubber gloves to avoid any possibility of shock. Once fluid is removed, check operation of components affected by the spill. Power Cord - Keep Power Cord away from heated surfaces. Air intake - Never block air going into the air intake at the" bottom of the blower assembly. out of the bed safely (and, if necessary, how to release the Side Rails) in case of fire or other emergency. Temperature - Recommended room temperature is 80 degrees or lower in a well-ventilated room. Higher room temperatures or poorly ventilated rooms may cause the blower assembly to overheat and shut down, suspending fluidization. the eyes, wash out eyes immediately. Do not pin or clip items to filter sheets. Inspect filter sheets regularly for damage, signs -0f excessive wear or any other evidence of un-serviceability. ln situations where the patient is particularly active on the bed surface there is a much greater potential for rips, tears or premature wear. both sheets upward to promote better airflow. When the service technician installs the unit, he or she will set up the bed according to the patient's height and weight. The unit is set up solely for the patient; others should not lie on the unit. The presence of others on the unit could result in patient injury, personal injury or equipment damage. WARNING: When using this product in the home, use a properly grounded, three-prong, 120 volt outlet. Failure to ground properly could result in personal injury, fire or house wiring. product is not in use, properly store the power cord away from traffic areas. Failure to do so could result in personal injury. The main control panel al the foot of the bed contains the main buttons for operating the bed. Note: Fluidization Lock-Out mode should be used at the caregiver's discretion to ensure against unintentional deactivation o of fluidization from the Remote Hand Control. Filter sheets (there are two) are the front line barrier between the microsphere beads and the patient. The cover sheet then is placed directly on the filter sheet and is the surface that the patient lies on. Do not pin or clamp items to the filter or cover sheets. Also, cigarette burns, tears caused by sharp objects and pinholes can cause bead leaks. Patient injury, personal injury or equipment damage could occur if beads were to leak through filter and cover sheets. The Air Pillows provide upper chest elevation and are controlled with the included Hand Controller. Additionally, Slant Wedge Cushions can be provided on demand. The Wedge Cushion pillowcase can be washed with regular detergent to provide adequate hygiene. When the FluidAir™ bed is operating the beads become fluid-like and conform to the shape of the patient's body to help relieve pressure. The FluidAir™ bed handles limited amounts of fluids passing through the filter sheet. To contain drainage, use absorbent material or breathable underpads without plastic backing. Excessive incontinence and bodily fluid saturates the beads and hinders fluidization. Petroleum-based topical ointments and silver compounds ruin the coating on the beads and pem1anently destroy their fluidizing properties. Take care when utilizing these types of products. The side rails are intended to be a reminder to the patient of the unit's edges, not a patient-restraining device. Keep the side rail in the up locked position when the patient is in the bed. 1. Plug Power Cord into a properly grounded 115 VAC, 15 AMP wall outlet. NOTE: Do not use a wall outlet controlleed by a wall switch. 2. Press the Air On switch on Main Control to turn the FluidAir ™ on. 3. Turn Air adjust knob on the Main Control Panel to the Max position. 6. Utilize a draw sheet over the green Gore-Tex® sheets to assist in positioning the patient. 1. Inspect the floor around the bed to verify no beads have spilled. 2. Set the Fluidization level on Main Control Panel to a comfortable position to create a firmer surface. 3. Lower the Side Rails. 4. Place pillow or slant wedge toward the head of the bed. 5. 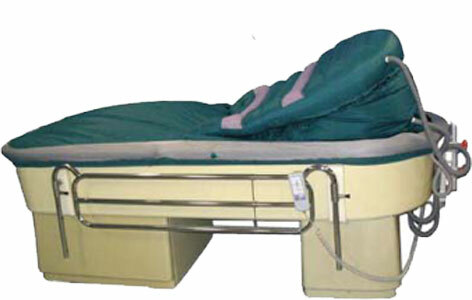 Before placing the patient on the bed, Lay a flat bed sheet on the unit. Do not tie the flat bed sheet down or tuck it in. 6. Transfer patient in accordance with safety rules. 7. Center patient in middle on support surface. Patient's waist should be just below the base of the pillow or slant wedge. 8. Verify there is sufficient slack in the cover and filter sheets to allow patient to be moved freely in any direction. Pulling the sheets too tight can create shear forces for the patient. 9. Ensure that Cover and Filter sheets are not wrinkled under patient. Periodically pull both sheets upward to promote better airflow. 10. Position the Foley Bag Holder as required. 11. Raise the Side Rails. 1. Verify patient is fluidized on the surface properly. Gently rock patient from side to side. 2. Ensure the Cover and Filter sheets are not wrinkled under patient. 3. Press Fluidization Lock-Out mode on the Main Control Panel to disable the Patient Remote Hand Control, as required. Note: Fluidization lock-Out should be used at the caregiver 's discretion to ensure against unintentional deactivation of Fluidization from the Remote Hand Control. 4. Ensure air intake (located at the bottom of the blower) is not blocked by a blanket or other object. The bed has a thermal cutoff that will automatically deactivate the blowers at intervals if the air intake is blocked.